With the exciting news earlier this year of being promoted to Senior Vice President of Asset Protection for Hudson’s Bay Company, comprising Saks Fifth Avenue, Saks Off 5TH, Lord & Taylor, Hudson’s Bay and Home Outfitters, Rosamaria has reached a career milestone that few obtain. As one of the industry’s leading executives she’s also the Chairperson for the National Retail Federation’s LP Advisory Council. Rosamaria has devoted her entire career to helping transform loss prevention into true stakeholders, by having a seat at the table and demonstrating how we can impact the entire organization, while also serving as a beacon in the community during times of crisis. With an emphasis on inspiring, developing, and mentoring, Rosamaria has impacted hundreds of retail executives. Having helped to develop the NRF’s Women in LP caucus, she’s shown her sincere commitment to helping develop tomorrow’s leaders. 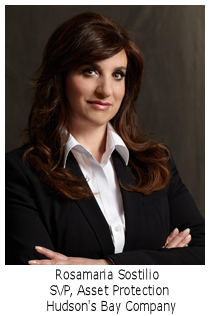 Rosamaria has close to 30 years of industry experience and is one of the first executives to assume a senior vice president position in Asset Protection. All of us at the Daily, and we’re sure the entire industry, would like to congratulate Rosamaria on her 25 years with Saks Fifth Avenue/HBC; truly a job well done!